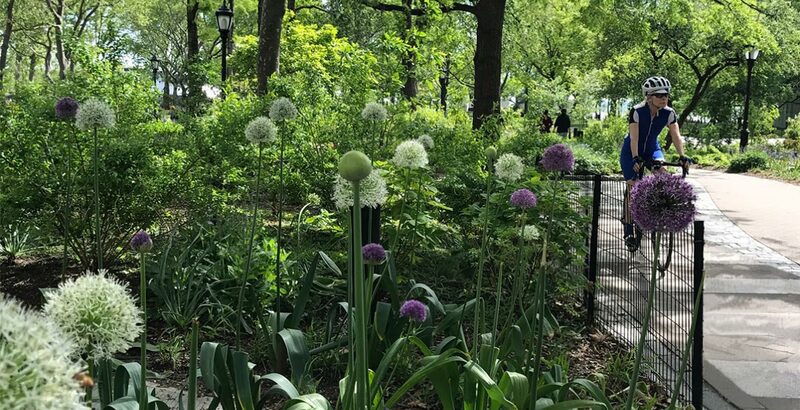 Together with the City of New York Department of Parks and Recreation, The Battery Conservancy transformed half the area of the park, creating The Battery Oval, Bikeway, and Woodland. The effort turned more than an acre of hard surface into green lawns and winding gardens and restored and relocated historic monuments to the park’s highly trafficked perimeter. The Battery Bikeway links the east and west sides of Manhattan, joining the East River Esplanade to the Hudson River Park bikeway. 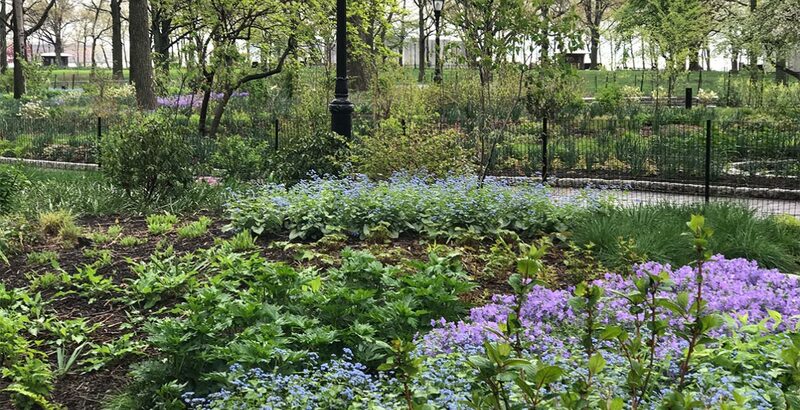 Cyclists, joggers, and pedestrians pass through beautiful new gardens designed by The Battery’s horticultural master planner, Piet Oudolf. The Battery Oval was created by reconfiguring The Battery’s three-acre entrance into a grand oval with a seating capacity of 8,000 people. The Oval, the only large public assembly place in Lower Manhattan, is a site for concerts, dance performances, festivals, and other public events. The Eisenhower Mall was dominated by asphalt. Fritz Koenig’s Sphere sojourned in the center of this space following September 11, 2001. Fabricate 300 movable Battery Chairs designed by the winner of Americas Design Competition, sponsored by The Battery Conservancy. After nearly five years of thoughtful preparation and hard work, the City of New York and The Battery Conservancy opened The Battery Oval in June, 2016. A place where New Yorkers can truly come together, it can comfortably accommodate 8,000 people. 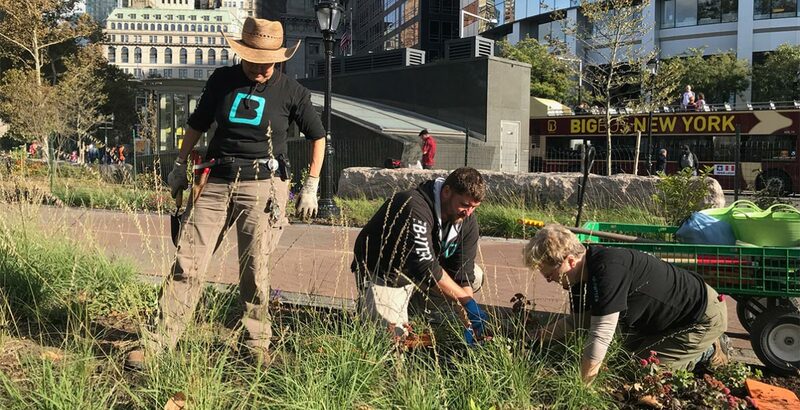 The Battery Conservancy started planning for the Oval lawn in 2011 at a three-day conference at Rutgers University’s Center for Turfgrass Science. The Battery team learned the basics of root development, soil mix, climate, irrigation, grass varieties and overseeding blends and techniques. The Battery Oval was planted between October 2014 and April 2015. There are ten watering zones containing a total of 140 watering heads providing flexibility in irrigation, to ensure the wisest use of water, the world’s most vital resource. Everything that goes in and on the lawn is organic and completely free of synthetic pesticides and fertilizers. It’s a lawn that’s as safe for chubby knees learning to crawl as it is for grown-up feet enjoying a rare chance to go barefoot in a neighborhood more known for stylish pumps, polished brogues, and well-worn running shoes. 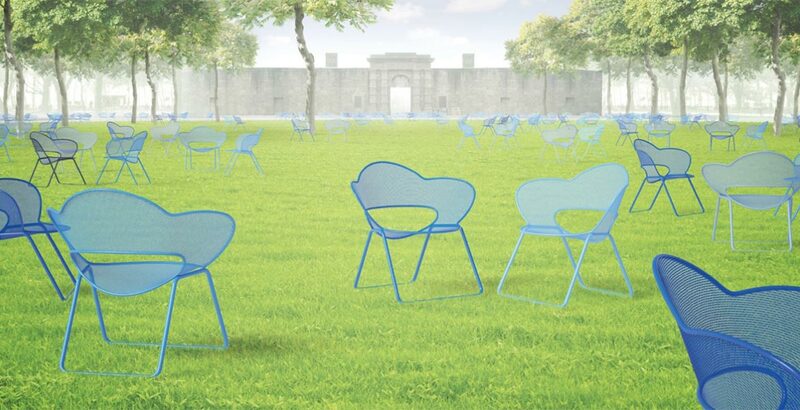 In 2014, The Battery Conservancy sponsored an open call to designers throughout the Americas to design a movable outdoor chair for The Battery Oval. Some 1,500 students and professionals responded with 679 submissions. Through a review and selection process that engaged world-renowned jurors, advisers, media partners—and even comments from the public—the winner was chosen: Canadian designer Andrew Jones. Andrew Jones took his inspiration from the scilla, a spring bulb that blossoms with delicate blue flowers, earlier in the season than most other bulbs. Scillas are the harbingers of the warmer weather to come and a source of encouragement to winter-weary people. Seward and Kissel LLP underwrote manufacture of the chairs by Maglin Site Furniture of Canada. Their gift celebrated 125 years of the law firm’s location in Lower Manhattan. Before the development of The Battery Bikeway, The Battery’s perimeter consisted of cracked, concrete sidewalk. Separate the bikeway from the sidewalk with a Stony Creek granite seating wall—evoking the matching stone used for the Statue of Liberty’s pedestal. The Battery Bikeway is the vital link between the east and west sides of Manhattan, connecting Hudson River Park and the East River Esplanade and completing the network of bikeways surrounding Manhattan. This linkage enables cyclists to access the area for recreation and commuting. In addition, the bikeway provides access to and from Peter Minuit Plaza, the transportation hub where buses, subway, and water transport intersect. Located between the pedestrian promenade and park interior, the bikeway buffers cyclists from street traffic. Riders wind their way down the serpentine path of The Battery Bikeway shaded by mature London Plane trees and bordered by Piet Oudolf’s perennial gardens and native shrubs. From 2003 until 2009, the Metropolitan Transportation Authority excavated and built a new South Ferry subway station complex under what was to become The Battery Woodland. This excavation destroyed 80 mature trees and made much of the park unavailable to the public for more than six years. mature trees, is perfect for picnicking, relaxing, or running around—especially before or after a ride on the neighboring SeaGlass Carousel. 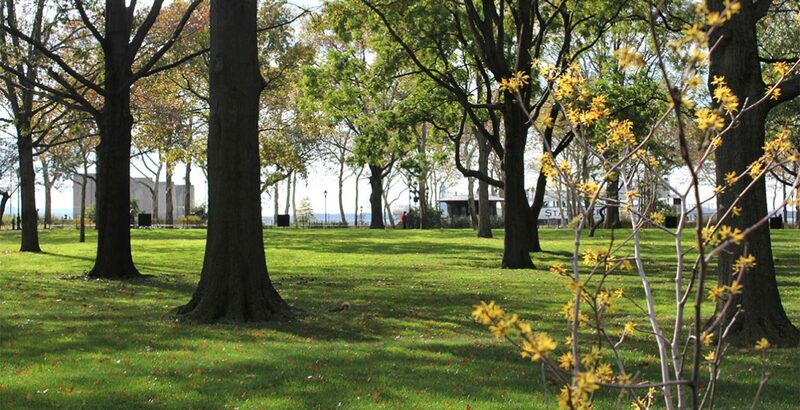 As with all other elements of The Battery’s landscape, the Conservancy maintains the Woodland without the use of synthetic fertilizers or pesticides. Amazingly, one of the world’s most dynamic transportation networks lies beneath this magnificent collection of New York native trees, including Willow Oak, Sweet Gum, and Tulip Tree. The woods, set in a lush lawn,evoke the landscapes that explorer Giovanni da Verrazzano described nearly five centuries ago. This section of the park was destroyed in the 1940s by the construction of the Brooklyn-Battery Tunnel (now known as the Hugh L. Carey Tunnel)—North America’s longest underwater vehicular tunnel—and then again in the 2000s by the construction of the new South Ferry subway station and turnaround loop, serving the #1 train. Riders of the #4 and #5 subway lines also travel beneath The Battery Woodland. And drivers journey between the West Side Highway and the FDR Drive in the vehicular Battery Underpass below the lawn. 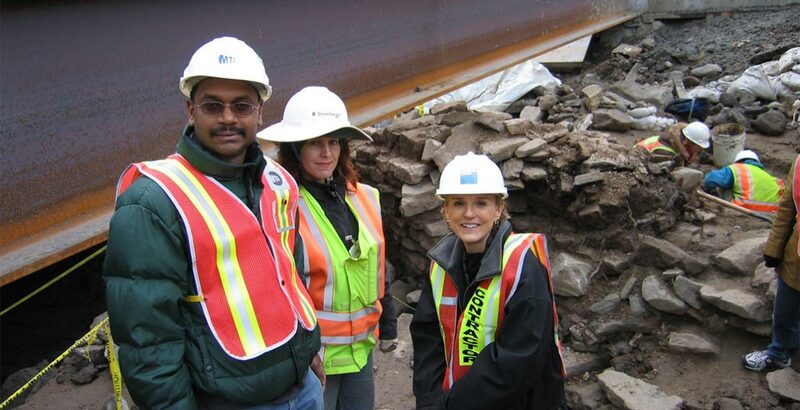 When excavating for the new South Ferry subway station in 2005, contractors for the Metropolitan Transportation Authority ran into an 18th- (or possibly even 17th-) century wall—a 45-foot-long section of Manhattan’s early fortifications. Eight feet thick, the wall was built on bedrock nine feet beneath today’s street level. Some of the stones are featured within the subway station, and more will soon be embedded in The Battery Playscape’s Adventure Bluffs for history buffs of all ages to marvel at. The Conservancy is now planning for the lawn’s future as a diverse 100-year woodland, grown naturally from two-inch saplings, based on the work of landscape ethicist Rick Darke.